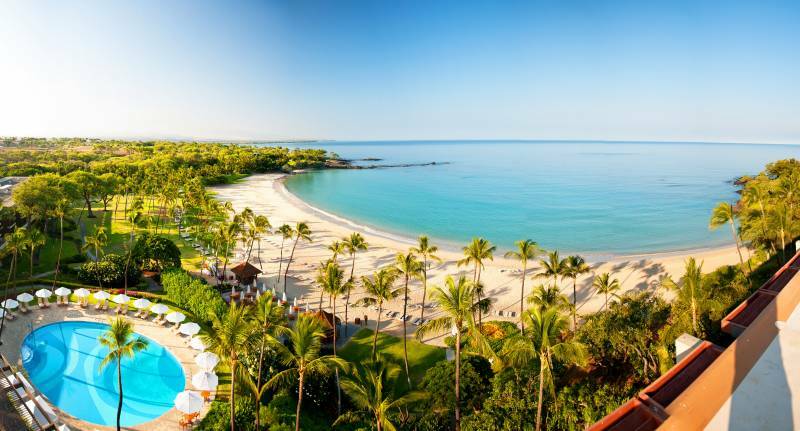 There are many appealing aspects of the Kona-Kohala Coast that draw visitors and buyers from around the world to Hawai‘i Island. Not the least of these is the perpetual sunshine enjoyed on along this beautiful stretch of coastline, punctuated by black lava fields and soaring, often snow-capped volcanoes. The excellent weather and the area’s raw beauty have made it the premier luxury real estate market in the state for decades. Beautifully clear water along the Kohala coastline. Photo Courtesy of Winston Welborn. This highly sought-after location has led the statewide market in sales above the luxury benchmark (currently considered any property above $3 million) for several decades. Last year, the rapid redevelopment of Honolulu’s urban core across Ala Moana and Kaka‘ako took the lead in the high-end category (largely due to foreign investors). But the Kona-Kohala Coast was a close second and contributed an impressive 82 property sales about the $3 million benchmark in 2017. 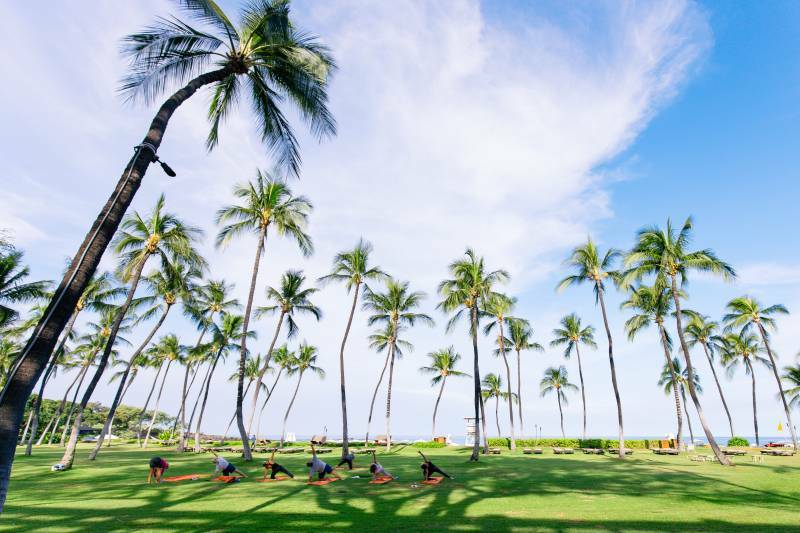 Yoga on the lawns of one of the many popular resort communities on the Kona-Kohala Coast. Many Kohala Coast homeowners have historically come from the San Francisco Bay area – mostly tech and finance industry buyers looking to get out of the wet weather, in search of the almost guaranteed sunshine and white powder sand beaches found at Kauna‘oa Bay, Anaeho’omalu Bay, and beyond. Michael Dell, founder & CEO of tech company Dell, as well as Charles Schwab, founder & chairman of The Charles Schwab Corporation, have both purchased properties in this part of Hawai‘i Island. What started the boom? 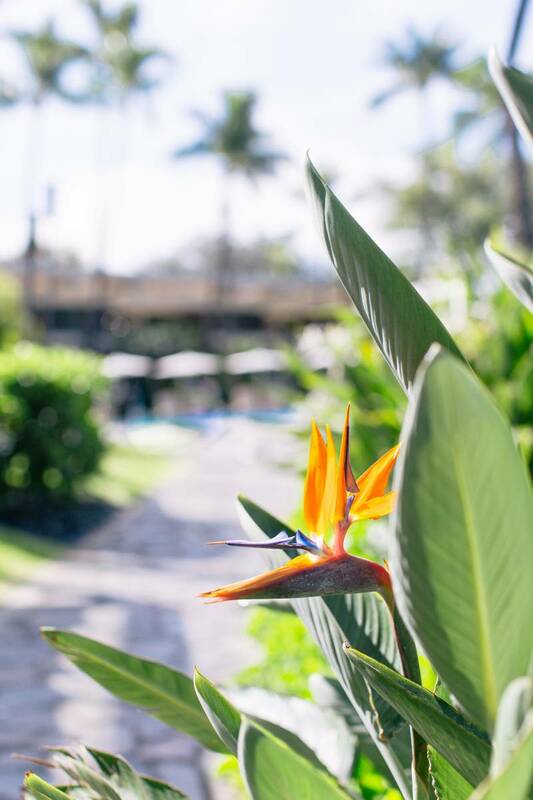 The Mauna Kea Beach Hotel, with its signature orange plumeria logo, was developed in this secluded locale by a pioneering venture capitalist named Laurance S. Rockefeller in the 1960s. It was the first lodging available north of Kailua-Kona, an architectural marvel built in the mid-century modern style, and it opened to critical acclaim, attracting Hollywood’s jet-set almost immediately. Jackie Kennedy, Carol Burnett, and Paul Anka were among the resorts first guests. The hotel’s golf course debuted with a tournament featuring The Big Three – Jack Nicklaus, Arnold Palmer, and Gary Player. The beautiful Kauna‘oa Bay that inspired the Mauna Kea Beach Hotel. The Mauna Kea Resort was the first to incorporate a residential component, making it the blueprint for resort communities around the world. Many resorts followed suit, both here in Hawai‘i, and around the globe. On the Kona-Kohala Coast of the Big Island, the most recent of these has been Kohanaiki. A family-friendly resort, Kohanaiki has attracted families small and large, predominately from the West Coast and Western Canada, but also from Japan, China and Europe. 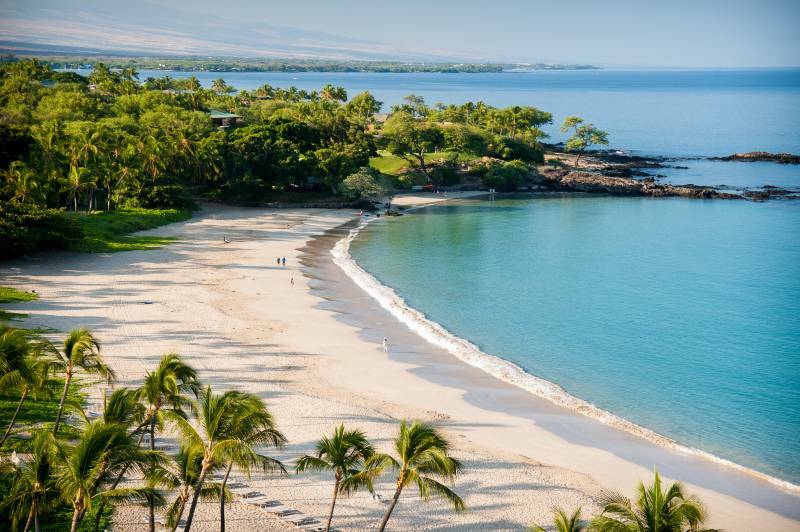 With so many direct U.S. flights from the West Coast to Kona, many homeowners hail from California and Washington State, but many seasonal owners travel from as far away as Texas to enjoy the Big Island’s abundant sunshine and raw beauty. Oceanfront fairway at Mauna Kea Golf Course, designed by Robert Trent Jones & recently updated by his son, Rees Jones. The region has earned its reputation as a paragon of luxury, sought-after by tech industry giants, foreign investors, and passionate golfers. 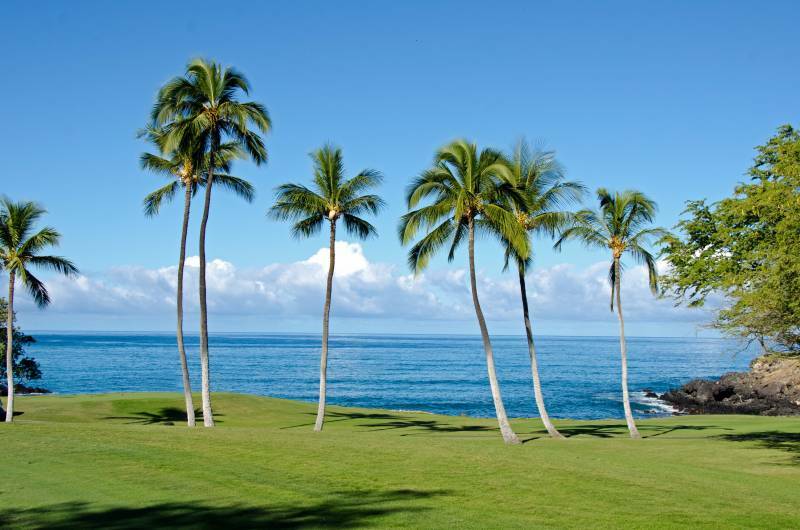 With a backdrop that includes the snow-capped Mauna Kea, the blue Pacific, and black lava fields that pose a stark contrast to the many greens, the Kohala Coast is popular for its world-class golf. All the big name designers are represented, including Jack Nicklaus, Robert Trent Jones Sr., Tom Weiskopf, Arnold Palmer, Tom Fazio, and more. There’s been an uptick in Japanese buying in the area for this singular attraction, since dry sunny weather, ocean views, and consistent temperatures make for excellent golf in the region. 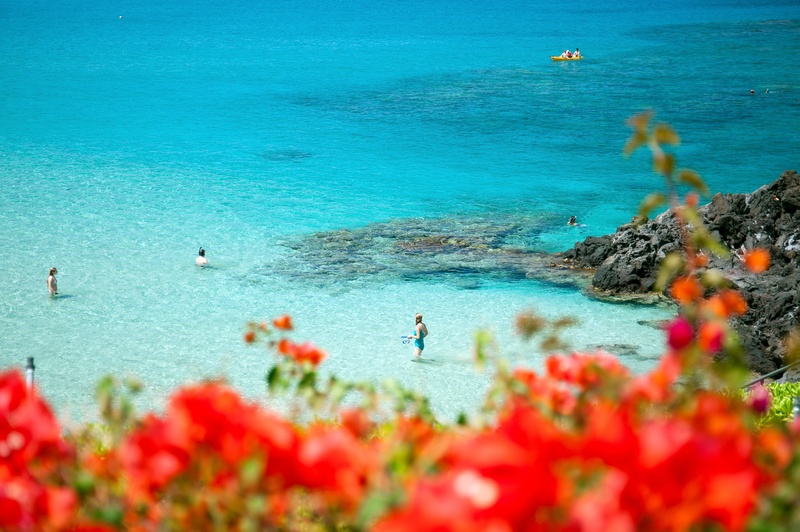 Crystal clear, calm waters on Kona-Kohala Coast of Hawai‘i Island. For potential home buyers interested in the Kona-Kohala Coast, the unique topography presents a wide variety of options – everything from beachfront property to ocean vistas from higher elevations, and from single-family homes, townhomes, condominiums and vacant land to super-luxury estates. House hunters can choose from a mix of views and vistas that may include Maui and any of the five volcanic peaks of the Big Island (the full show or the “five volcano view’, as it’s known). What may surprise readers is that on average, 80% of luxury properties purchased in the area over the past eight years were paid for in cash. This compares to an average of 71% for the statewide high-end market. 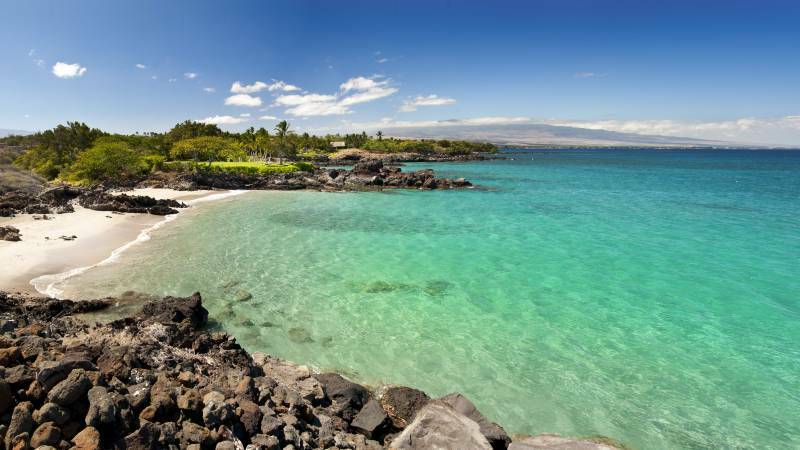 So as you can see, the Kona-Kohala Coast is attracting a highly solvent and wealthy buyer profile. In fact, the area is home to one of the largest concentrations of deca-millionaire homeowners in the nation. Kauna‘oa Bay on the Kohala Coast, as seen from a luxury suite at the Mauna Kea Beach Hotel. Photo: Winston Welborn. Steve Hurwitz and Bob Chancer have been representing buyers and sellers along the Kona-Kohala Coast for more than three decades. They’ve watched its evolution and have played an integral part in the area’s development over the years. They recently joined the Hawai‘i Life family. They are the principals of Mauna Kea Realty – A Hawai‘i Life Company, which serves as the exclusive brokerage company of Mauna Kea Resort. A boutique agency that has grown into one of the most successful in the Hawaiian Islands, Mauna Kea Realty’s team of professionals are a wealth of market knowledge. They specialize in the resort communities that have emerged since Mauna Kea Beach Hotel opened its doors in 1965. This distinctive lifestyle has been their company’s singular focus for decades. To learn more about the collaboration that is now Mauna Kea Realty – A Hawai‘i Life Company, please click here.